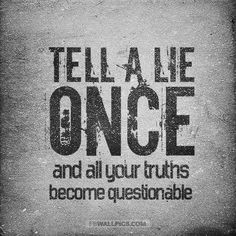 I think there are many times in life where a lie is much easier than the truth. We all have done it at some point. I’m a very trusting person until I find out I have been lied to. I will then trust nothing you tell me. Safe places come in many different shapes and sizes. They come in a form of friendships, they come in the form of buildings that are seemingly indestructible, they come in the shape of communities, and typically in the shape of relationships with people we love the most. We create these for ourselves and sometimes we can create a safe place with someone else. When the walls of this said place break down, we retreat. Where do we retreat? We become vulnerable, scared, and a being mixed with every emotion all at one time. We want to shut down, we want to run, but to where? Safe places are valuable. They are mandatory for growth in health and development. They are mandatory for every ounce of living. Whether in a parents arms, Gods arms, or a structure’s, they are a necessity. When someone uses a safe place to take advantage of someone else’s vulnerabilities, they are stealing. They are robbing life from the vulnerable individual. They are thieves. These thieves think that since they live anonymously or seemingly hidden lifestyles, that they will never be brought to justice. Well, I have seen the way you thieves live. You live long tormented lives. You attempt pills, alcohol, great job titles, and whatever else you hide behind. Truth is, I know you’re miserable. I know you hope someone buries you and lets you die alone. So your facade, it doesn’t work with me. Your charming attitude, your similarities, your fake fears, and made up feelings. All your ploys they are visible. Your smooth “cultish” manipulations that are whispered in your ear from below, are most clear. My safe place has been destroyed before. I came back stronger, wiser, and understood. I am not vulnerable. I am not an easy target.